With the start of the 2016 Rio Games, Premier Boxing Champions’ past Olympic boxers have reflected on their journeys from Olympians to professional champions. From Bronze medalists - current heavyweight champion of the world Deontay Wilder (Beijing 2008) and super middleweight champ Andre Dirrell (Athens 2004)– to three-time Olympians and fighters representing over 10 countries, Premier Boxing Champions celebrates the Olympic spirit on its website (http://www.premierboxingchampions.com) and social media channels (Facebook, Instagram, Twitter). A three-part video series of PBC Olympians wishing good luck to Team USA (https://www.youtube.com/watch?v=sx5B8g-tOec) as well as features on PBC’s fighters and their journeys will be on the website. Included will be a reflective feature on Olympian and current featherweight world champion Gary Russell Jr. (Beijing 2008) and his younger brother’s 2016 Rio games journey. Also, London 2012 Olympian Errol Spence, Jr. on realizing his dreams in a year with the NBA ‘Dream Team’; three-time Olympian Rau’shee Warren on his Olympic village experience, as well as quotes from fighters representing their home countries including Abner Mares (Mexico), Julius Jackson (Virgin Islands), Sakio Bika (Cameroon) and Beibet Shumenov (Kazakhstan) reminiscing on their experiences. “Just knowing and understanding that you’re representing your country…It’s such an amazing feeling,” Marcus Browne, Team USA, London 2012. “When you represent Team USA, you represent your country. 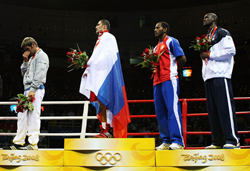 Just go out there and put on the best performance you can,” Jamel Herring, Team USA, London 2012.